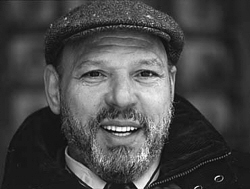 The fourth of seven children in Pittsburgh’s Hill District, August Wilson was born Frederick August Kittel, April 27, 1945 to an African American mother and a German immigrant father. By the time he was five, his parents divorced. His mother remarried in the late 1950s and the family moved to the predominately white working class Hazelwood District. The only black student at his Catholic high school, Wilson transferred schools and ultimately dropped out of school at age 15 when he was accused of plagiarism. Wilson earned his high school diploma from the Carnegie Library. After a short stint in the Army, Wilson began writing poetry while working various low paying jobs. Although already a published poet, it wasn’t until 1965, while listening to a Bessie Smith record, when Wilson was inspired to write about African American history and culture through plays. That same year, he formally changed his name to August Wilson to honor his mother. August Wilson wrote Jitney!, the first in his cycle of ten plays and it proved to be a success. It went on to be produced by the Allegheny Repertory Theatre in Pittsburgh. His play, Ma Rainey’s Black Bottom, was accepted for workshop production at the Eugene O’Neill Theatre Center in 1982. After 275 shows and several awards, the show finally closed in 1985. Wilson’s career skyrocketed with his play Fences, written in 1983, which generated his first Pulitzer Prize. As Fences was still in production on Broadway, Wilson’s next play, Joe Turner’s Come and Gone, was released making Wilson the first African American to have two simultaneous plays on Broadway. In 1986, August Wilson wrote The Piano Lesson, which won a Tony Award for Best Play, the New York Drama Critics’ Circle Award, and the Pulitzer Prize for Drama. Wilson became one of only seven American playwrights to be awarded two Pulitzer Prizes. Wilson’s next two plays, Two Trains Running and Seven Guitars received several awards. He then moved to Seattle in 1990 where he wrote his final plays.